Watching fireworks is popular and fun. But fireworks are explosives and burn at high temperatures, so they need careful handling and storage. Garden Fireworks (or Category 2 Fireworks) are intended for use in restricted areas, eg large gardens. Fuse Time 3 to 13 seconds. Debris No lit debris to fall below 3 metres ouside a safety distance of 3 metres. Labelling All must be labelled according to BS 7114. Viewing Distance A minimum of 5 metres. Fuse Time 5 to 15 seconds. Debris No lit debris to fall below 3 metres ouside a safety distance of 20 metres. Viewing Distance A minimum of 25 metres. The Standard sets out construction, performance, labelling and testing criteia for the firework types available to the general Public in the UK. When buying fireworks ALWAYS look for those complying with the British Standard. This will be shown on the firework selection box and the fireworks themselves. READ the instructions and warning label on the firework, and DO WHAT THEY SAY! 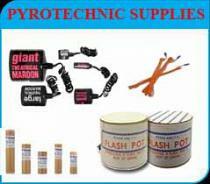 If you buy British Standard Fireworks AND you use them according to the instructions you will have a safe and enjoyable display. It is illegal for anyone under 18 to possess a firework in a public place. 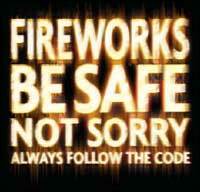 Fireworks cannot be set off by a private individual between 11.00pm and 7.00am except for certain nights of the year. Unless retailers possess a special licence they may only sell fireworks from 15 October to 10 November and 26 to 31 December. Only buy fireworks that meet BS 7114, from a reputable retailer. Keep them in a closed, fireproof box. Only take out one at a time and replace the lid. 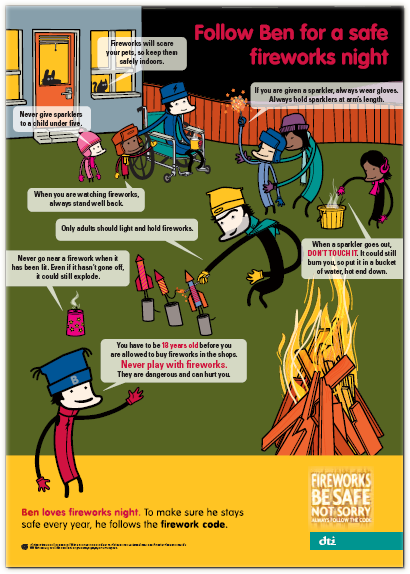 Follow the specific instructions on each firework, using a torch. Light the firework at arm&apos;s length, with a taper, never a match or lighter. Never go back to a firework once it is lit. Never put fireworks in a pocket. Don&apos;t give sparklers to children under five years. sparklers, like other fireworks, must be used with care. They can get 6 times as hot as a pan of cooking oil and sparkler injuries have been on the increase. It makes sense to keep sparklers in safe hands. Always light sparklers one at a time and wear gloves. Never hold a baby or child if you have a sparkler in your hand. Plunge finished sparklers hot end down into a bucket of water as soon as they have burnt out. They can stay hot for a long time. Don&apos;t take sparklers to public displays. It will be too crowded to use them safely. Never give sparklers to the under 5s - they will not understand how to use them safely. Always supervise children using sparklers. Give children gloves to wear when holding sparklers. Avoid dressing children in loose or flowing clothes - they may catch light. Show children how to hold sparklers - away from their body and at arm&apos;s length. Teach children not to wave sparklers near anyone else or run while holding them. Cut around material sticking to the skin - don&apos;t pull it off. Don&apos;t touch the burn or burst any blisters. Cover the burn with clean, non-fluffy material - cling film is ideal - to prevent infection. If clothing catches fire, get the person to stop, drop to the floor and roll them in heavy material like a curtain. Get advice from your doctor or accident and emergency department at your local hospital. 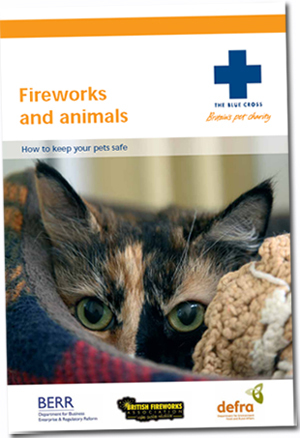 Rabbits, guinea pigs, hamsters, gerbils, mice, ferrets and birds all need to be treated with special care when fireworks are being let off. These animals are easily frightened. The Blue Cross advises that owners of such types of small animal should follow these precautions. If you cannot bring your pet&apos;s hutch inside, you should turn its enclosure around so that it faces a wall or fence instead of the open garden. Always keep dogs and cats inside when fireworks are being let off. Make sure your dog is walked earlier in the day before the fireworks start. Close all windows and doors, and block off catflaps to stop pets escaping and to keep noise to a minimum. Draw the curtains, and if the animals are used to the sounds of TV or radio, switch them on (but not too loudly) in order to block out some of the noise of the fireworks. Ensure dogs are wearing some form of easily readable identification (ID) - even in the house. By law, they should have at least a collar and tag. Think about fitting pets with a microchip, so that if they do run away they have a better chance of being quickly reunited with you. Prepare a &apos;den&apos; for your pet where it can feel safe and comfortable - perhaps under a bed with some of your old clothes. It may like to hide there when the fireworks start. Let your pet pace around, whine, miaow and hide in a corner if it wants to. Do not try to coax it out - it&apos;s just trying to find safety, and should not be disturbed. Try not to cuddle and comfort distressed pets as they will think you are worried too, and this may make the problem worse. Instead stay relaxed, act normally and praise calm behaviour. Avoid leaving your pet alone during such potentially upsetting events. If you do have to leave the house, don&apos;t get angry with your pet if you find it has been destructive after being left on its own. Shouting at a frightened pet will only make it more stressed. Don&apos;t tie your dog up outside while fireworks are being let off, ie outside a shop while you pop inside, or leave it in the garden or in your car. Never take your dog to a firework display even if it doesn&apos;t bark or whimper at the noise, it doesn&apos;t mean it is happy. Excessive panting and yawning can sometimes indicate that your dog is stressed. Try to make sure that fireworks are never set off near your horse&apos;s field or stable. Tell neighbours and local fireworks display organisers there are horses nearby, so that they can ensure fireworks are set off in the opposite direction and well away from them. Keep your horse in its familiar environment, in its normal routine with any companions to make it feel secure. If your horse is usually stabled then keep it stabled. If it is normally out in the field, keep it there as long as it is safe, secure and not near the fireworks&apos; display area. Ensure that you or someone experienced stays with your horse if you know fireworks are being set off. This way you can observe its behaviour, ensure it remains as safe and calm as possible and respond to its reactions appropriately. If you know your horse reacts badly to loud noises speak to your vet or perhaps consider moving your horse for the night. Try to remain calm and positive as horses can sense unease in a person and this might make things worse if the horse is startled. Don&apos;t take the risk of riding when you think fireworks might be set off. If it is necessary for you to leave your horse in the care of another person during a firework display leave clear instructions and contact details for yourself and your vet should any problems arise. The DTI publishes comprehensive fireworks safety information at www.dti.gov.uk/fireworks. The DTI also provides full details on the sale and use of fireworks, Fireworks Regulations 2004 and the Fireworks Act 2003. Don&apos;t cut corners just to save a few quid. Always buy fireworks from a reputable shop to make sure that they conform to British Standards. This means that they should have BS 7114 written on the box. Sometimes shops open up for a short time before Bonfire Night but these may not be the best places to buy fireworks from. 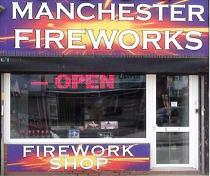 Staff in these firework shops might not be very knowledgeable about using fireworks safely and their fireworks might not meet British Standards. Whatever you do, don&apos;t buy fireworks from anywhere you&apos;re not sure about, such as the back of a van or from a temporary, unlicensed market stall. if you are looking for a fireworks in manchester Manchester Fireworks sells only the highest quality fireworks all brittish standards approved. If any fireworks did not go off properly soak the firework thoroughly in water to ensure the chemical composition is destroyed. Be careful what is placed on the bonfire. Many modern materials can give of toxic, carcinogenic and even lethal fumes. Only burn wood and paper. Wood-like materials such as chipboard contain a mixture of wood (chippings, laminate, sawdust) and plactic based adhesive/resin. This is not suitable bonfire material. If you are burning a Guy Fawkes effigy don&apos;t be tempted to use polystyrene packaging material for the stuffing. Newspaper is traditional and best! Don&apos;t let kids play in and on the bonfire before it is lit. They can get crushed or stabbed by nails and sticks. Fireworks create a wonderful visual spectacle for those on the ground, and are a great family entertainment. In the United Kingdom, fireworks are traditionally used to commemorate Guy Fawkes Day on and around 5th November. Fireworks are now also used throughout the year to celebrate New Year, Birthdays, weddings and mark the end of festivities or concerts. Firework displays can be used to collect money for charity and provide entertainment and provide pleasure to millions each year. They can however be dangerous. Many fireworks dispense canisters several hundred feet into the air, and when used near an airport there is the possibility that they could be detonated in the path or in close proximity of an aircraft. Fireworks detonated in the flightpath of aircraft can cause danger by their unexpected dazzle and visual damage to pilots. For the safety of flight crew and members of the public in the air and on the ground, we have prepared the following information. If you are organising a firework display or intending to use fireworks close to Manchester Airport, please read this data sheet carefully. If you have any remaining concerns or queries, please contact Manchester airport. 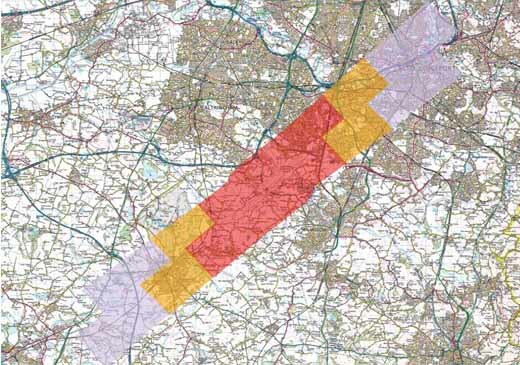 I live close to the Airport; Can I hold a firework display? Please see information below and refer to the map above. You may use Category 1 & 2 Fireworks only. No rockets or Category 3 Fireworks. You may use Category 1, 2 & 3 Fireworks. No rockets. You may use Category 1, 2 & 3 Fireworks.